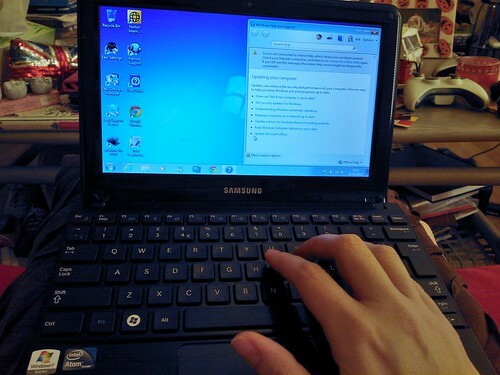 Sniffles Saturday | The Tales of Missus P.
I must say, I am really glad that Santa brought this netbook to us. It’s so much more convenient to sit on the couch with a 10 inch machine and type up stuff. We even used it to order the groceries this week. While I usually work at home on the PC and keep all my files on Scrivener and Word there, but having the ability to type from another vantage point is nice as well. Today we both slept in but had gotten up a few times through the early morning due to this stupid cold that will not go away. Both of us have pressure in our sinuses, coughing, and plugged up ears. It’s absolutely maddening, especially since we both don’t feel sick, just walking around with symptoms. Still, we need more medicine and even though the weather isn’t great (wow, January is a depressing month) we’re going to venture out. It’s already after 2PM and I’ve been watching Dirty Dancing in HD from the V+ plus (I really need to buy this on Blu-Ray and get it over with.) But since we’re losing daylight, I’ve got to get moving. This entry was posted in All About Me, Movies, Technology, Writing and tagged Dirty Dancing, flu, health, netbook, weather. Bookmark the permalink. I’ve been looking at the Surface… but may go with the Netbook. Something small. The laptop I have now is a dinosaur! The Surface is the dream laptop for sure. Too bad it’s so pricey right now. Maybe next Christmas! Me again – I added some tags to your Kindle book page of Cupcake wishes. It looks cute! What does the “1” stand for in the lower right hand corner? Book One? Reading Level One? Just curious. Aww. Thank you so much! The book is the first in the Cupcake Witches series. It seemed easier to just give a number for each book instead of a new title. The second one will be out this year and we’re working to get the first in print ASAP. Fun, good luck with this one and the rest of the series.